Universal Studios Singapore is a must visit attraction if you are travelling to Singapore with kids. As theme parks go, there’s something here for every member of the family to enjoy, no matter what age. 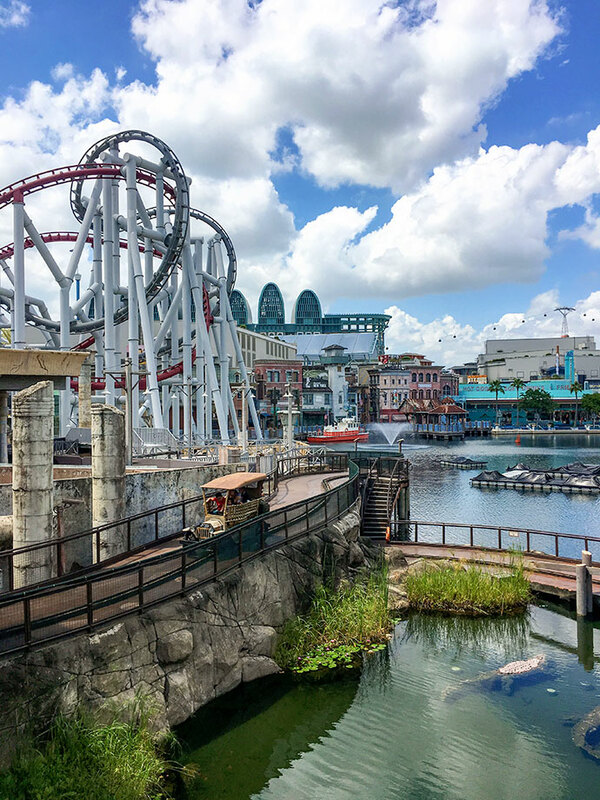 On our most recent trip to Singapore this January, we spent a day at Universal Studios Singapore and had a great time. 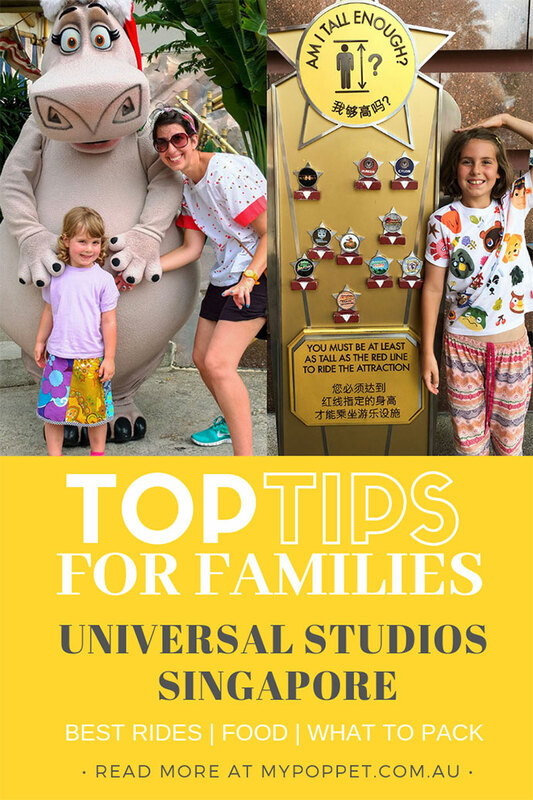 If you are planning on visiting Universal Studios Singapore with kids I’ve rounded up my top tips and recommendations for a successful visit in this handy guide to Universal Studios Singapore for Families. As a rule, we don’t generally plan our travels around visiting theme parks, but if there happens to be a theme park in a city we are travelling to, I’ll always try to set aside a day for a visit. 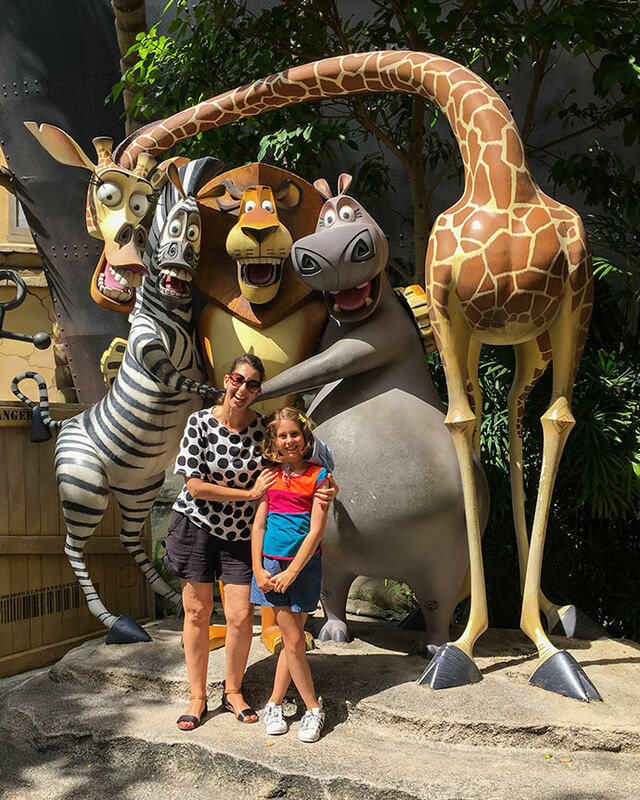 During this Singapore family holiday, we stayed in the city for 2 nights, then at the W Hotel in Sentosa Cove for 2 nights, and visited the theme park during our stay on Sentosa. 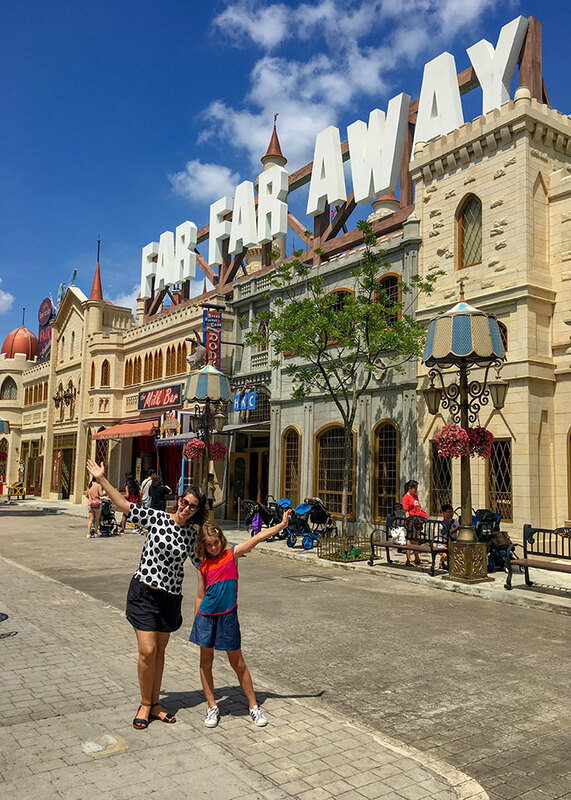 Universal Studios Singapore is so close to the city center (around 15-20min by taxi), that even if you aren’t staying on Sentosa Island, it’s an easy day trip with kids. A Theme Park so nice we’ve visited twice! 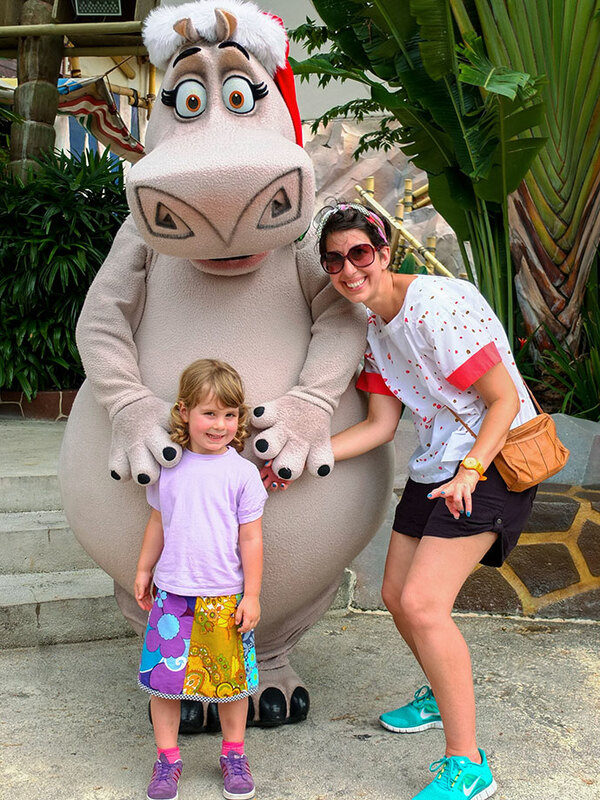 This was out second visit to Universal Studios Singapore, the first was back in 2013 when Emma was just 3yo. Six years on and now Emma is 9yo and tall enough to go on every ride, so understandably our experience was a little different this time around. 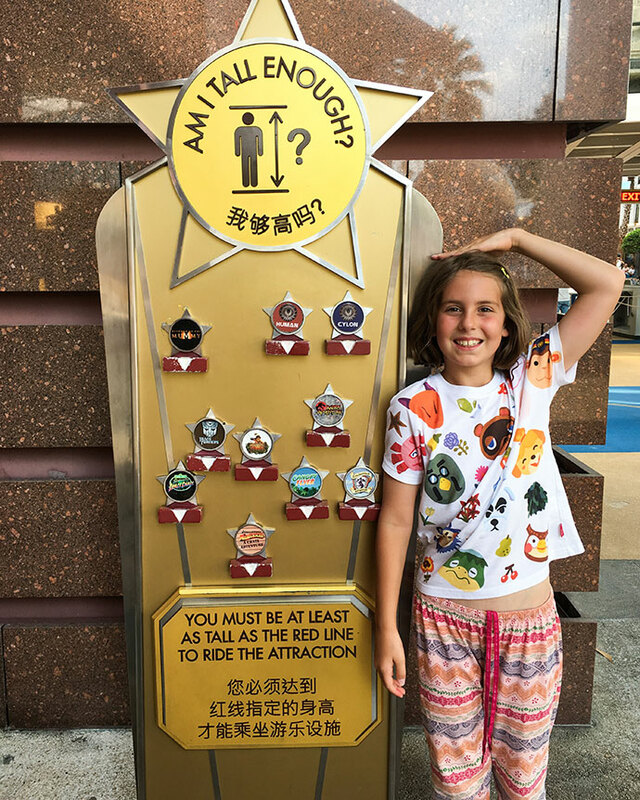 At 145cm Emma is tall enough to go on every ride! 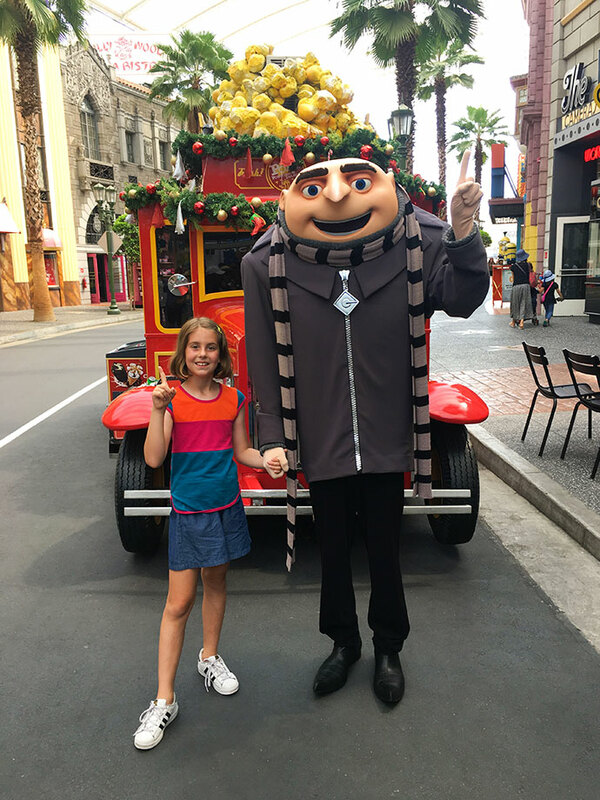 Having visited Universal Studios Singapore with both a toddler and a tween, I thought it would be useful to put together a Family Travel Guide to Universal Studios Singapore for those of you that were planning on visiting with kids of any age. 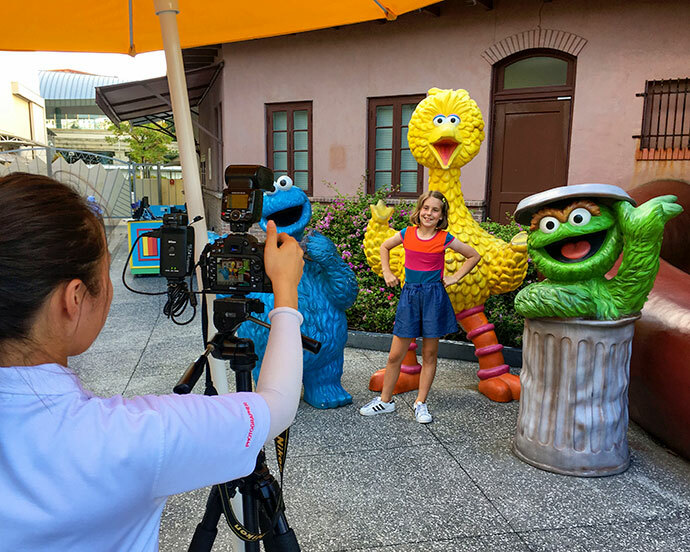 This is an epic guide full of all the information you need for a successful family visit to Universal Studios Singapore. There is lots of information so you can either just scroll down, or jump directly to the information you are interested in by clicking the titles in the Table of Contents below. Universal Studios Singapore is Theme Park located within Resorts World Sentosa on Sentosa Island. It’s not a huge park, and quite a lots smaller than other Universal theme parks around the world. 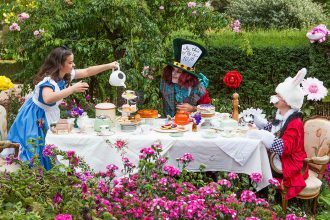 Its compact size isn’t a downside, in fact, it makes it ideal for families with younger kids, or for visitors with limited time – you can experience everything in one day! 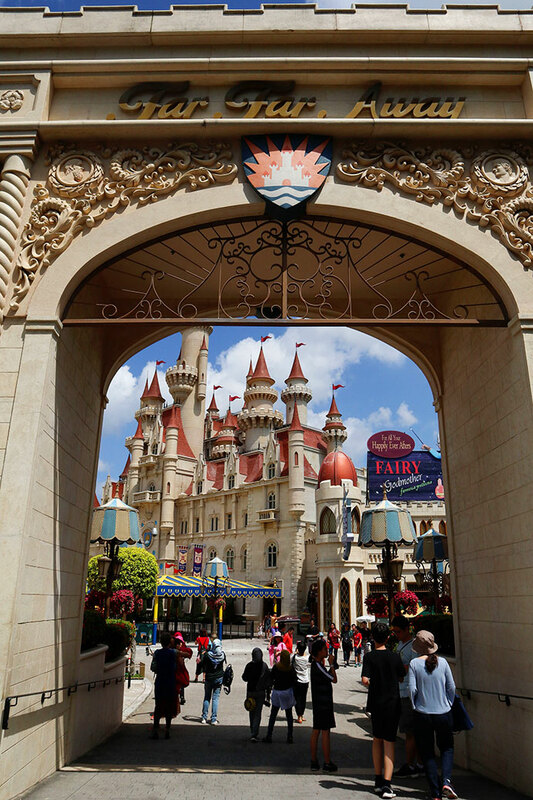 The park features 24 rides, shows and attractions spread across seven themed zones, 18 of them original or adapted for Singapore. The Universal properties featured include Shrek, Madagascar, Transformers, Minions and Sesame Street, just to name a few. 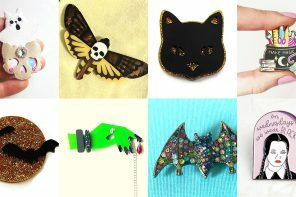 If you kiddo is a fan of a of these, they are going to absolutely love it here! 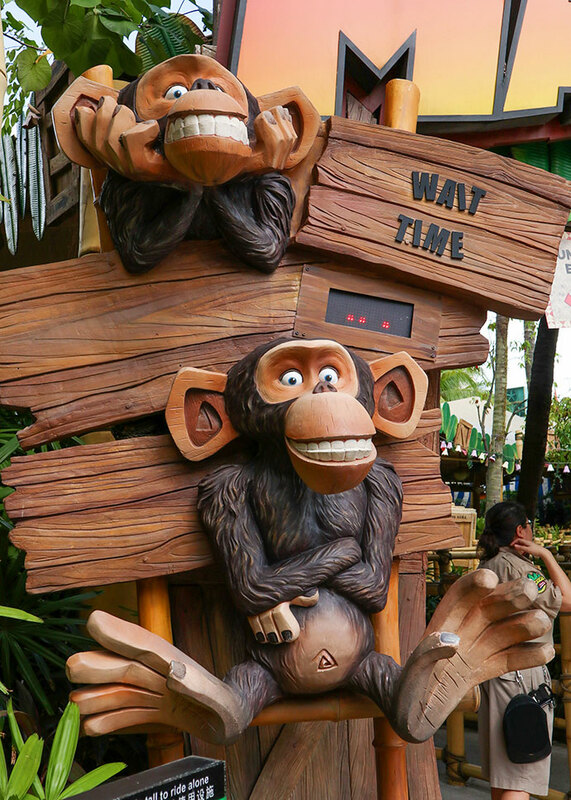 There’s nothing worse than waiting in line for hours for just a few rides because everybody in Singapore decided to visit on the same day. Add to that Singapore’s year round hot and humid weather and you’re likely to have some very grumpy kids on your hands! 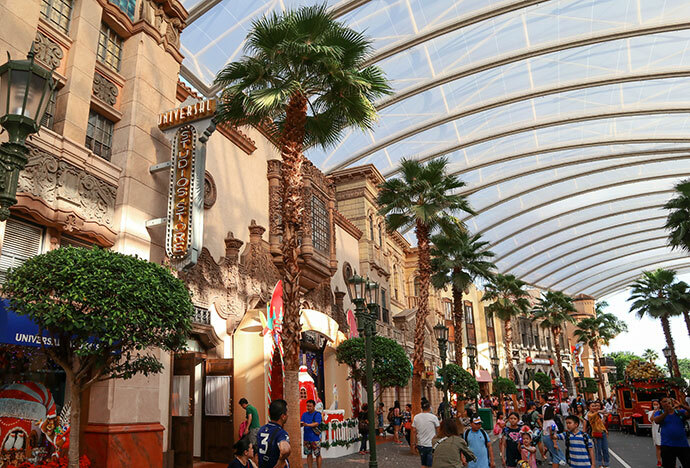 Universal Studios Singapore can get very busy at certain times of the year so if you want to avoid crowds, avoid visiting on weekends, public holidays, CNY, and around March, June, September and December local school holidays. 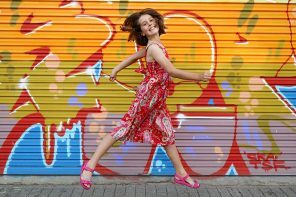 Here’s a list of Singapore school holiday dates for 2019. The park is generally quieter from Monday-Thursday. 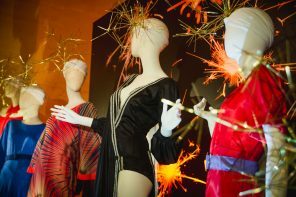 The only downside of visiting on quieter days is that opening hours are generally shorter, and you’ll miss the parades and fireworks shows which tend to be only scheduled on holidays and weekends. 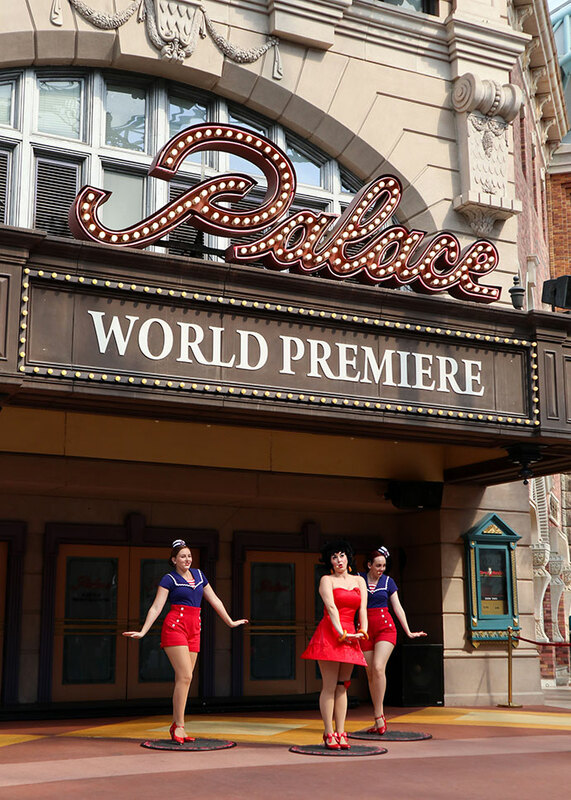 Click here for the Universal Studios Singapore events calendar. If you have no choice but to visit on busy days, get there as the gates open and head straight to your favourite area. 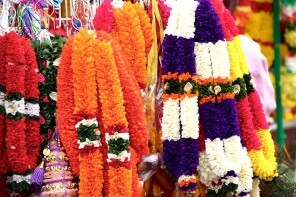 Singapore has a tropical climate that is hot and humid all year round. 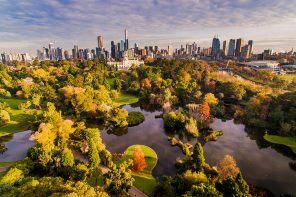 Weather wise, the wettest months are between November and January, when showers can last for long periods of time, while the hottest months are May and June. We’ve been twice in January and never had any rain. 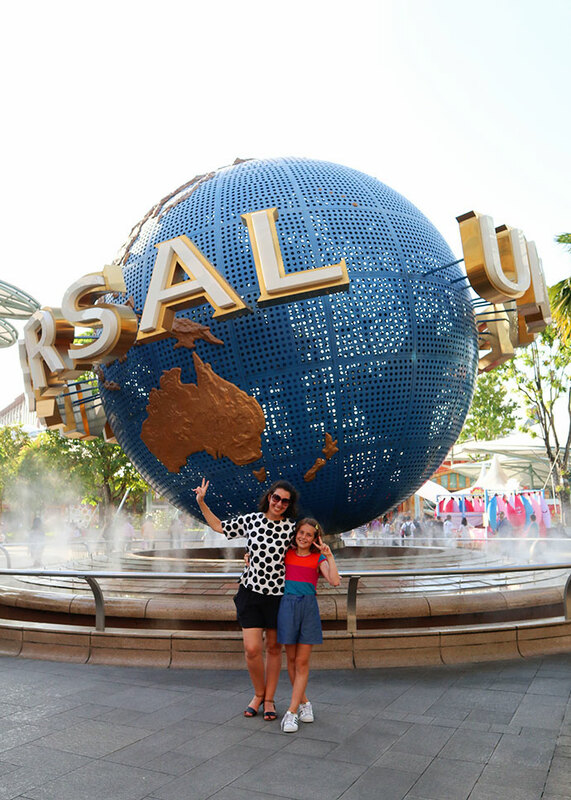 If you are visiting Singapore for a short holiday it’s likely you’ll only be visiting Universal Studios for a single day. Like most theme parks, Season Passes are also available and are much better value if you foresee yourself visiting more than once in 6-12 months. Tickets are available for purchase online (recommended) where you can sometimes nab special offers like included meal vouchers, or at the gate. 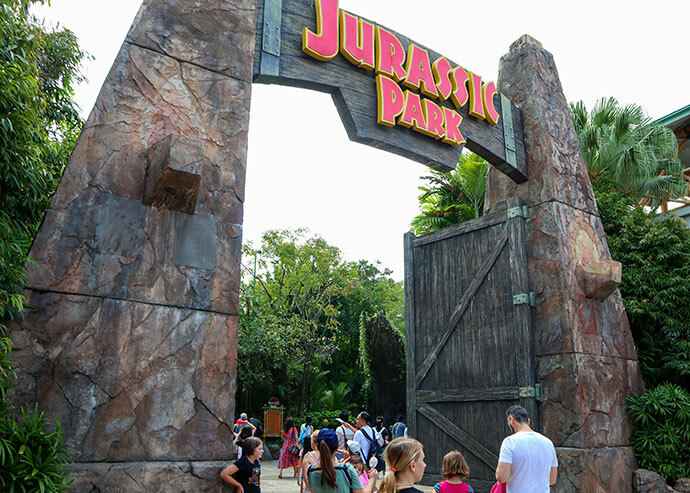 One-day ticket – Entrance ticket for the Park – Adult (Age 13-59) SGD79 | Child (Age 4-12) SGD59. Valid for one visit, within 30 days from the selected visit date so if plans change you can still use them before or after your selected date. Allow you to use a separate (shorter) queue for rides. These aren’t entrance tickets. Nearly every ride or show has an express queue except for a few attractions. There is a limit as to the number of Express passes issued per day. Express Pass prices start from $40-$70 (on top of the entrance ticket price) and there are 2 types. They’re dynamically priced so getting them earlier, especially during peak season means getting them cheaper. You can still get them inside the Park but the price may be more expensive than booking online. We’ve visited the park both with and without Express Passes and even on a quiet day I’d recommend getting an Express Pass if you can afford it. With the Express Pass wait times were no more than 5-10min compared to up to 50min for some rides. Most rides we just walked on. They also get you priority/better seating in some shows as well as the front seats on some rides (but not always guaranteed). Unless you plan on going on the same one ride many many times, the regular Express Pass is fine. Thrill-seeking teens/adults may get benefit from the Unlimited Express Pass if they plan on riding on the big roller-coasters multiple times as they had the longest wait times. Keep your express passes handy as you’ll have to show them at every ride entrance. Passouts – You can leave the park during the day with a re-entry stamp. handy if you’d like to grab lunch outside the park or need a little break. Universal Studios Singapore is super easy to get to from anywhere in Singapore. Taxi – If there is 3-4 of you taking a taxi is quite an economical way to travel to Sentosa Island. Depending on the traffic a taxi ride from the city center will cost around SGD$12-$20. 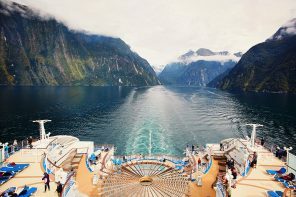 There is also a fee to enter the island of around $5. Handy if you have a pram or kids that tire easily. 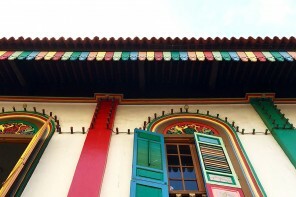 Singapore Cable Car – For breathtaking views of Sentosa Island a cable car ride from Vivo City is the way to go, although at around SGD$33 it’s quite the extravagance. If you are staying on Sentosa island catch the free inter-island shuttle Bus Route A stopping at Resort World Sentosa, or the Sentosa Express and alight at Waterfront Station. From Sentosa Cove use the W Hotel shuttle or Bus B to Beach Station transfer hub then Bus A.
light breathable clothing that covers your back and shoulders to prevent sunburn. 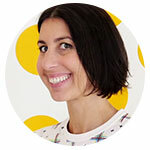 shorts or leggings, as many rides require strap fastening between legs which makes skirt wearing awkward. comfortable shoes that either stay on (for rides that let your feet hang) or are easy to remove. Waterproof shoes are recommended for Jurassic Park Rapids. A drink bottle, preferably with an ice-block insert. Water filling stations are located throughout the park but the water is not chilled. Plastic poncho or a change of clothing as you’ll get wet on some rides and shows. Camera for capturing memories – the friendly staff are happy to take group photos. A stroller if you have small children, especially handy for daytime naps (rental single and double strollers are available). There is stroller parking outside each attraction. Your wallet filled with cash! You’ve bought your tickets and made all the plans, now it’s time to have fun! 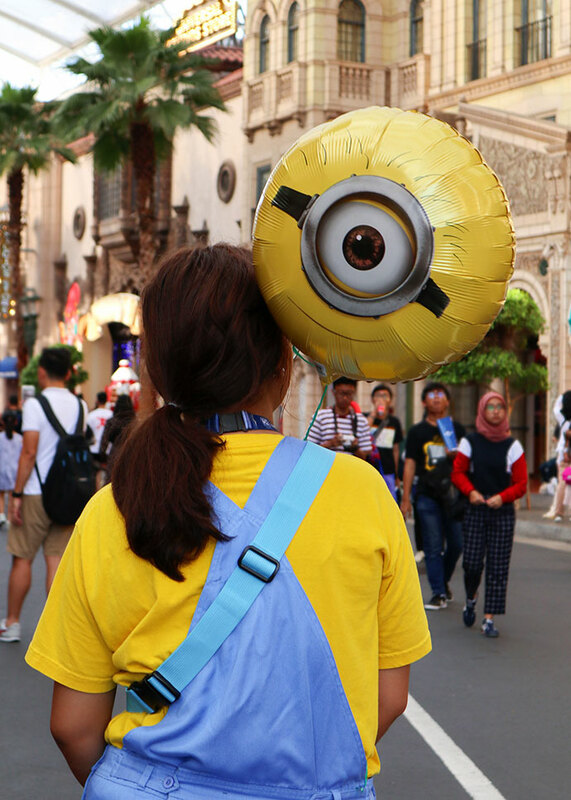 Universal Studios Singapore is an all-day experience so allow at least 6 hrs for your visit. Most people stay from opening to closing. It’s important to pace yourself as the heat can really take its toll. Ideally plan on alternating rides and outdoor activities, with watching the shows and character meet-and-greets. 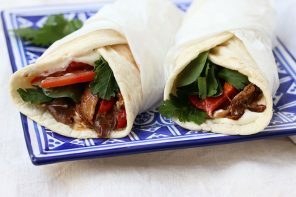 If you are feeling overheated, pop into an air-conditioned store or eatery to cool off. Pick up the daily program as you enter – this has a list of all the street performance and show times in each area. It will help you plan your day especially if you are keen to get photos with the characters. As the sun goes down the park lights come on and everything sparkles. If you are lucky enough to visit during a late night opening, find a good spot around the lake to enjoy the fireworks. The park is laid out like a lollipop. You enter through the gates into the Hollywood area (that’s the lollypop stick) and then the rest of the park areas are laid out in a big circle around Lake Hollywood, the central lake. When you get to the end of the Hollywood strip you’ll either head either left or right. I’d recommend turning left if you have younger kids as the zones here are more kiddy-oriented. First you’ll find Madagascar, followed by Far, Far, Away, and then The Lost World. Turn right if your kids are older (taller) and seeking ‘thrills’. First you’ll encounter New York, followed by Sci-Fi City, and then Ancient Egypt. This then joins up with The Lost World. 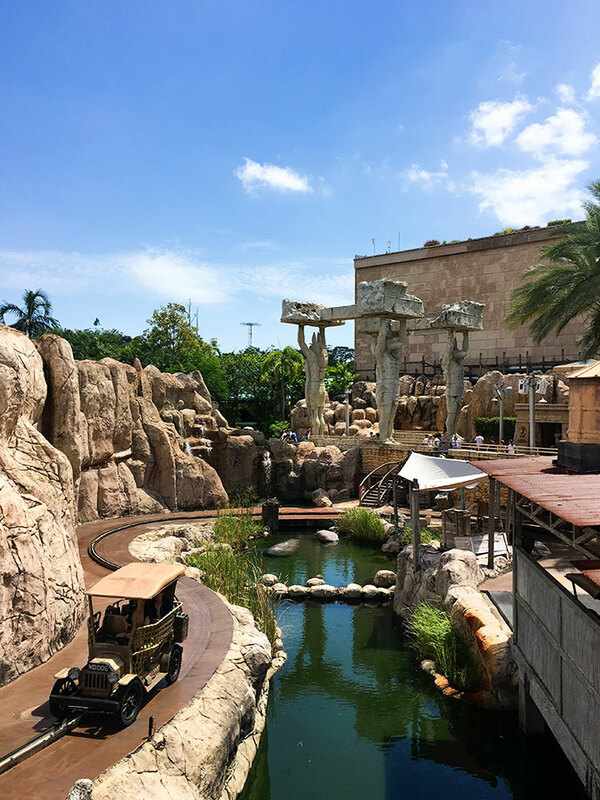 Decide beforehand which are your must-do rides at Universal Studios Singapore and head over directly to the rides on your “wish-list” first. This is a better strategy than trying to take every ride you come across in the park sequentially along with the rest of the crowds. The park isn’t that large so it doesn’t take long to get from one side to the other, especially if you take the shortcut I’ve suggested below. 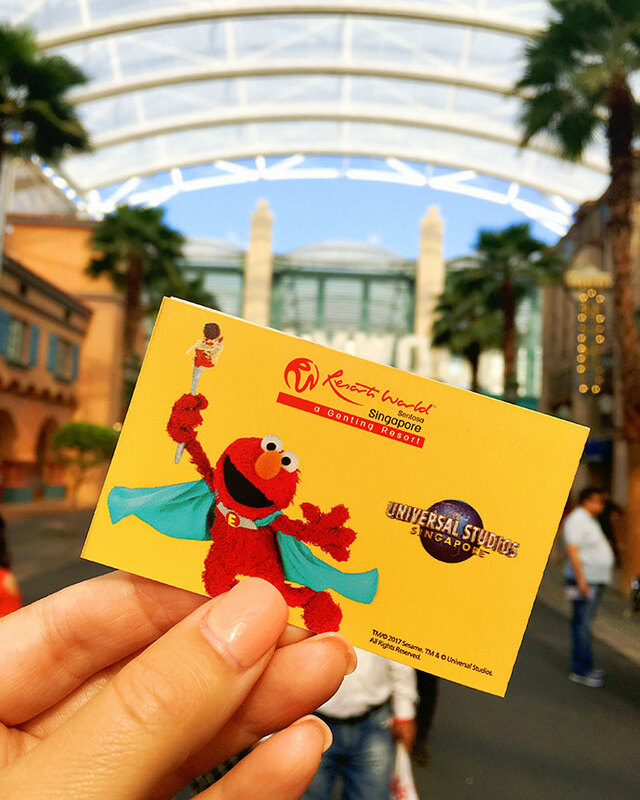 Universal Studios Singapore Ride List – from the most thrilling to the most gentle. Queuing in the heat is not fun especially with kids. Here are some suggestions for minimising waiting times. Take advantage of Child Swap at selected rides. The child swap allows parents to take turns on rides that do not allow toddlers on them, making a swap after without having to join the queue from the start again. Rides that have the single rider queue are Revenge of the Mummy, Transformers, Jurassic Park Rapids Adventure and Canopy Flyer. Rides with no minimum heights must have an adult escorting the child. No hand-held infants are allowed. Treasure Hunters ride in Ancient Egypt zone. Even with Express passes there are 2 rides that don’t have express queues. 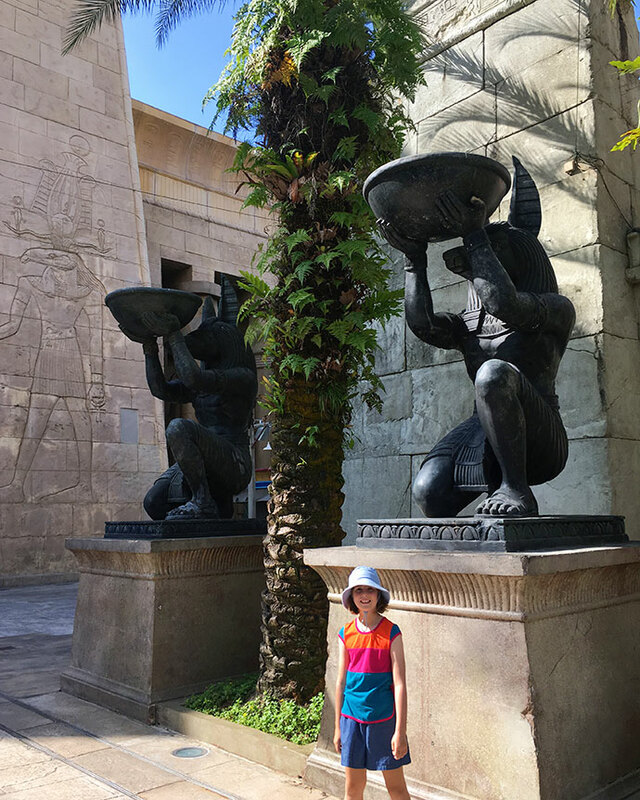 Treasure Hunters in Ancient Egypt is a car driving ride and perfect for young kids, but the queues get super long, so head there early and get it out-of-the-way. Canopy Flyer in the Lost World is another fun (but short) ride that doesn’t have an express queue. The lost world section opens an hour later (11am) so on the day we visited we hot-footed over to it as soon as it opened. If you don’t have an Express Pass go straight to Sci-Fi City to TRANSFORMERS The Ride: The Ultimate 3D Battle. This ride is awesome and I’ve heard the queues can get up to 3 hours long which insane! SHORTCUT: Avoid the crowds and take the shortcut straight to Sci-Fi City and Ancient Egypt. Head down the path in-between Mel’s Drive-In and the lake, make your way past the wharf and you will arrive at Sci-Fi City. Turn left and you are in Ancient Egypt. Based on Hollywood Boulevard with its iconic Deco architecture, palm trees and walk of fame. 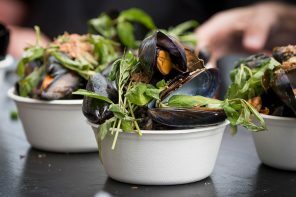 Here you’ll find mainly retail outlets and places to eat. Tip: It’s the first area you’ll pass through as you enter, but walk right on through and visit later in the afternoon when you are done with the rest of the park. The area is covered so it’s a good place to retreat to for some shade or if it’s raining. One of our favourite zones! 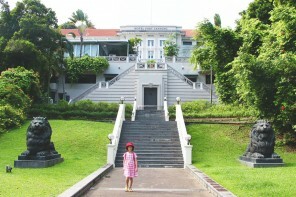 Emma, even as a 3yo had such vivid memories of meeting her favourite characters here. 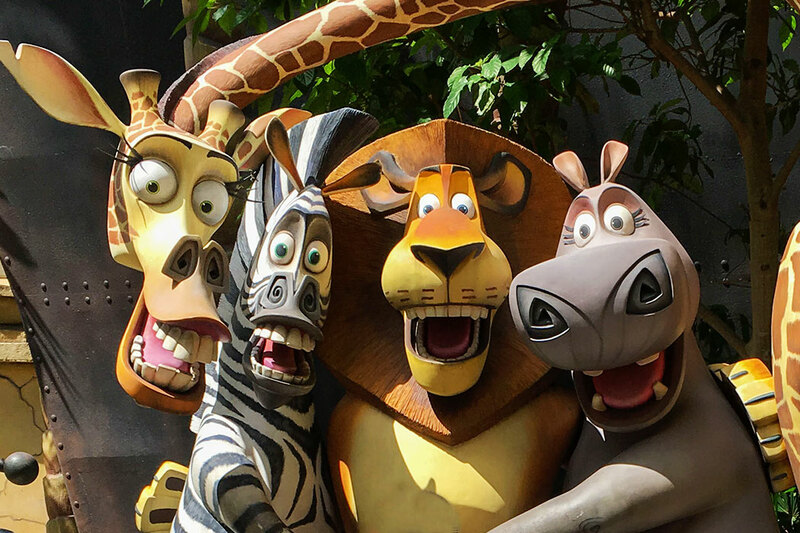 If you are a fan of the DreamWorks Animation Madagascar movies, you’ll really enjoy all the details they’ve included in this area. As you walk in, take a look up at the giant baobab tree where you’ll find the plane and skeleton pilot just like in the movie! A perfect zone for younger kids. Here you can meet Alex, Marty and the rest of the gang. There’s a fun Madagascar Boogie performance with character photos afterwards. Check for showtimes. Tip: This area tends to get quieter later in the day as most people head here first. 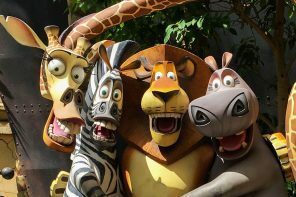 Madagascar: A Crate Adventure (min height 80cm)- A river boat adventure and help King Julien defeat his nemesis – the dreaded Foosa – at the rim of a bubbling volcanic cauldron. 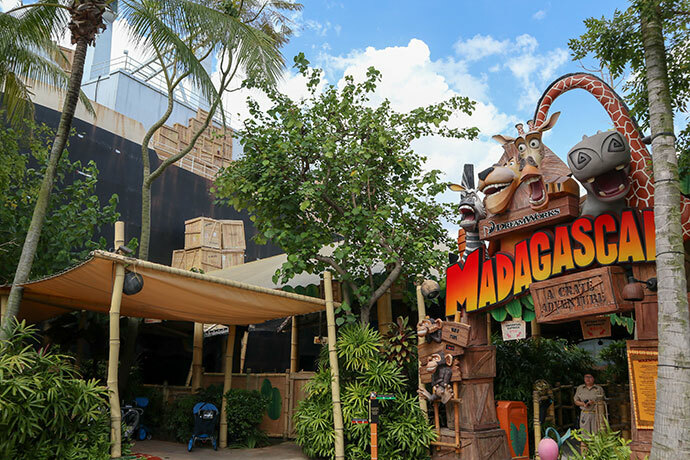 This ride is an indoor “dark ride” that features state-of-the-art animated figures, digital projection, evocative sound, and moving show-action effects that create a one-of-a-kind, immersive ride experience. Watch out for the monkeys flinging poo! It’s a gentle ride but lots of fun! Bonus, it’s air-conditioned. Wheelchair accessible – there is a special boat that caters to wheelchair users. 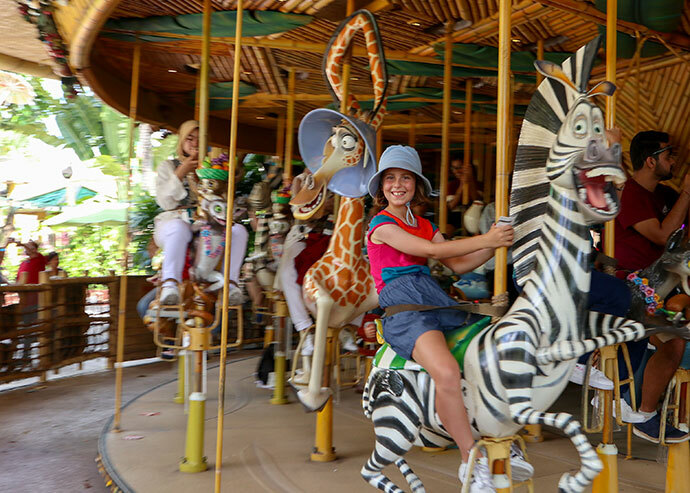 King Julien’s Beach Party-Go-Round (no min height if escorted) – This merry-go-round has all your favourite characters. (See if you can spot the handbag lady). Nice and relaxing if you need a break from thrill seeking and the lines are usually fairly short. We rode this one an embarrassing number of times. 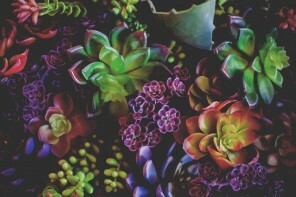 Step into the land of Far Far Away, inspired by the world of DreamWorks Animation’s Shrek franchise. Full of humorous puns straight out of this fairy tale gone a little wrong, adults and kids will enjoy hanging out here. Take a stroll along Far Far Away’s glamorous Romeo Drive, there’s a very photogenic castle and some funny details that fans will enjoy. Tip: This area has 3 shows and 2 eateries which makes it a great place to take a rest. There are a few outdoor tables with shaded seating. Shrek 4-D Adventure – A 4-D movie experience located within the world’s only Far Far Away castle. You’ll see, hear, and even feel the action right from your seat. Suitable for all ages. Nice and cool inside. 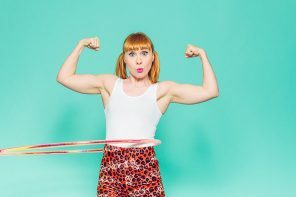 This show, along with the Donkey LIVE show both exit through the Fairy Godmother’s Potion Shop where you’ll find a ‘secret ride’ for really little kids – a mini ferris wheel called Magic Potion Spin suitable for tiny tots. 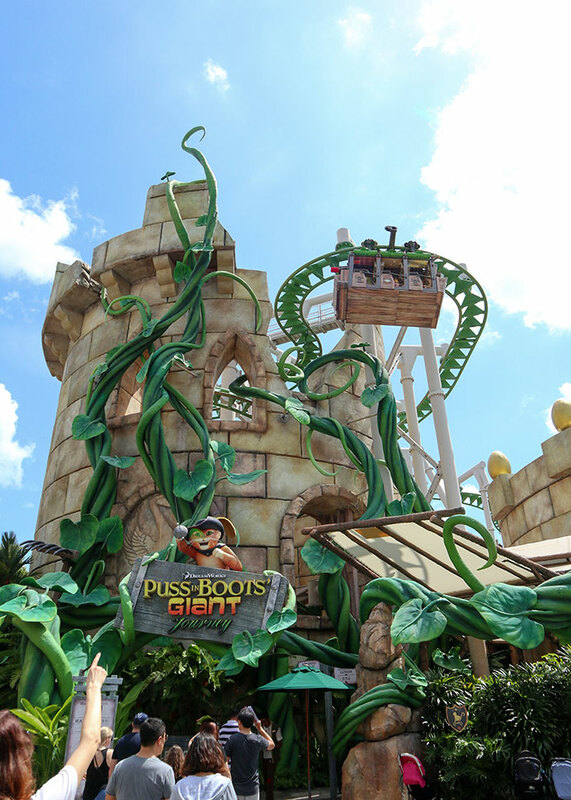 Puss In Boots’ Giant Journey (min height 100cm) – It was our first time on this ride which opened in 2015. A story telling roller-coaster themed around the Jack and the beanstalk story in Puss in Boots. The queue was quite long for this one so the express pass came in handy. My favourite part was how they decorated the queuing area as the giants kitchen with giant cookbooks, utensils and spices. Enchanted Airways (min height 92cm) – A junior roller-coaster perfect for thrill-seeking little kids. Another ride where the waiting area is full of puns and humorous details. This coaster has enough twists and turns to entertain riders of all ages. Divided into two themed areas, Jurassic Park and WaterWorld. This area opens at 11am. This zone has something for everyone. High energy stunt shows, water rapid rides where you will guaranteed get wet! Fun zones for little kids and toddlers and some really good street performances. It’s also a nice place to grab some shade as there are plenty of lush tropical gardens with low walls ideal for sitting on for a rest. 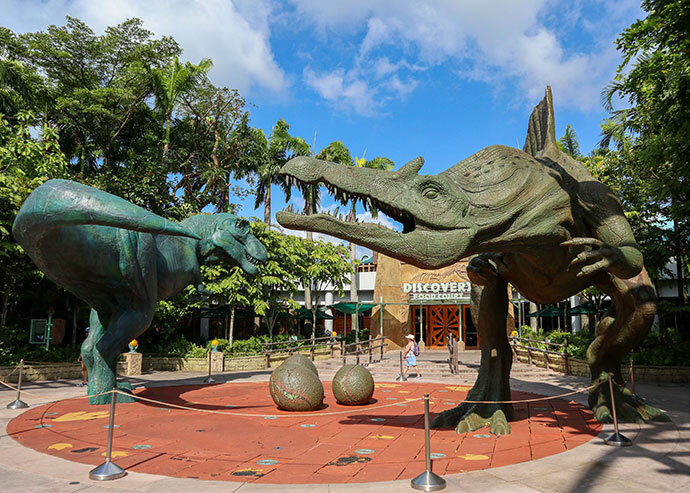 I think this area works really well because in the movie Jurassic Park was actually a theme park, so you are stepping into the role of the visitors in the movie. My favourite experience in The Lost World was the Keeper and Velociraptor performance. The dino was a super cool animatronic puppet that was so convincing that Emma was a little bit wary of it. We caught the show by accident, but I’d recommend putting it high on your list of ‘must see’ performances. 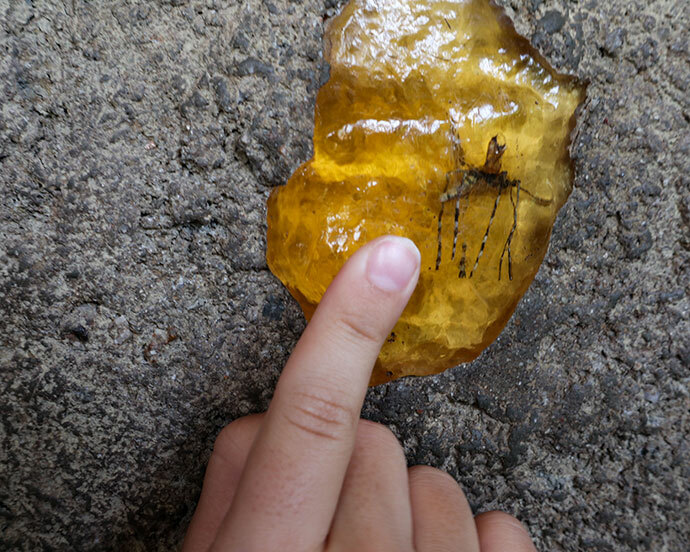 Take some time out to spot some interesting details like insects stuck in amber. Tip: Towards the back of The Lost World, there is a rock-climbing attraction. 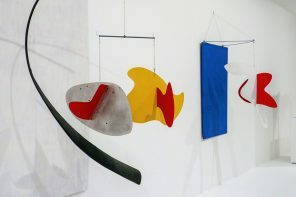 Amber Rock Climb has three levels, Easy, Medium and Difficult and no height limit. It’s pretty physical so most people skip this if it’s too hot. 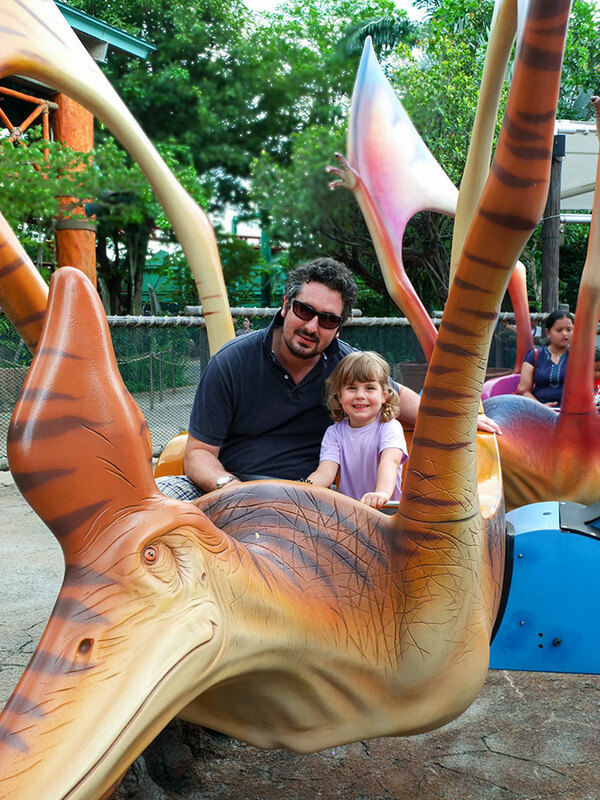 Dino Soarin’ (no min height if escorted) – A gentle ride where children can pilot pre-historic Pteranodons. Basically an up-down spinning ride. For very little kids it’s awesome. There are a fun little play areas for little kids here too. 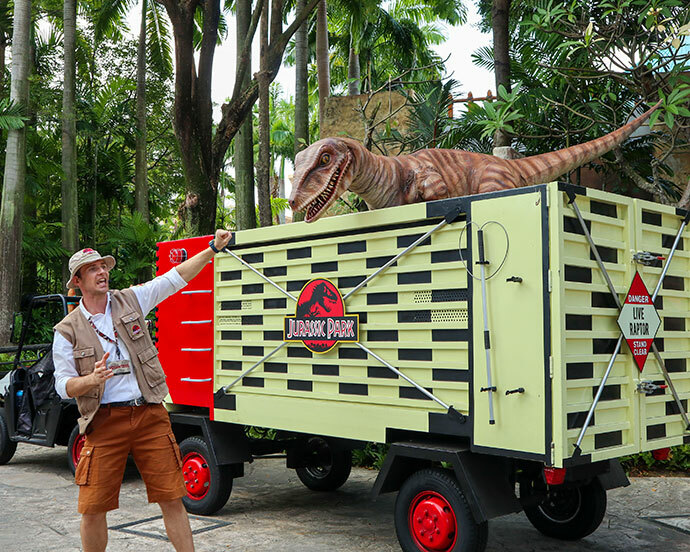 Jurassic Park Rapids Adventure (min height 107cm)– A white water raft system, thrill-seekers on circular rafts will be tossed on waterways within the Jurassic Park compound, where prehistoric creatures roam free. It starts of gently but quickly things in the story go wrong and the T-Rex escapes and you need to evacuate! This ride is awesome but you will get WET! Not just splashed, but soaked through. The foot wells fill up with water so if you have nice leather shoes on, you may want to take them off. I recommend bringing a pair of thongs (flip-flops) with you just for this ride. You’ll also end up sitting in a puddle of water so be prepared for a wet bum. You’ll dry off quickly on a hot day, but if it’s a bit cooler consider wearing a poncho or using the drying pods afterwards (which cost an exorbitant $5)! Also if you have a bag or camera gear with you don’t place it on the floor unless it’s waterproof. Pop anything you don’t want to get wet in a big plastic bag or pop it in a locker. If you don’t want to pay for a locker, the closest free lockers are in Ancient Egypt. Canopy Flyer (min height 92cm) – This is quite a short ride (53 sec), often with a long wait time as there is no express pass. I’d recommend lining up for it as soon as this section of the park opens. You hang off a track as it zooms over The Lost World. I’d only recommend this ride if the wait time is 15min or less. You’ll need to remove slip-on shoes, and there are little cubbies to store your shoes and bags. If you don’t mind sitting next to a stranger, this ride has a single rider queue which moves fairly quickly. This was once a water play area. Probably for the best that it’s now closed as most kids probably got drenched here. Water World – Based on the blockbuster film, “WaterWorld”, witness a tidal wave of death-defying stunts and awesome explosions of fire and water. There are a couple of performances a day, check for show times. 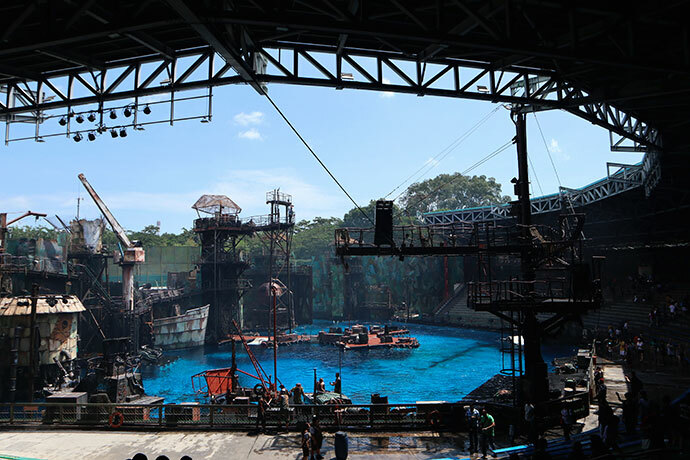 WaterWorld is set in one of the largest amphitheatre of its kind in the world featuring 3,500 seats, and over 30 stunts in the 20-minute spectacle. The seating areas are marked according to how wet you are likely to get. Kids and teens may enjoy the ‘splash zones’, adults not so much. There is lots of audience participation and a chance to get photos with the actors if you stick around at the end. The arena is big so you can usually walk in just before the show starts (unless it’s a super busy day). Bring along some snacks and a drink to enjoy as it’s a good opportunity to have a break from walking. If you haven’t had the chance to visit the real temples in Luxor Egypt, the replicas in this section of the park are the next best thing. There are lots of great photo opportunities to be had amongst the statues and temples in this mini Ancient Egypt. The rides here are based around the movie ‘The Mummy”. Emma hadn’t seen it when we visited but watched it as soon as we got home because she liked the narrative of the rides so much. It’s a very small section of the park with one of the very best rides, Revenge of the Mummy. But don’t rush off afterwards, walk thought the palm tree and statue lined colonnade for awesome views of Lake Hollywood and the rest of the park. 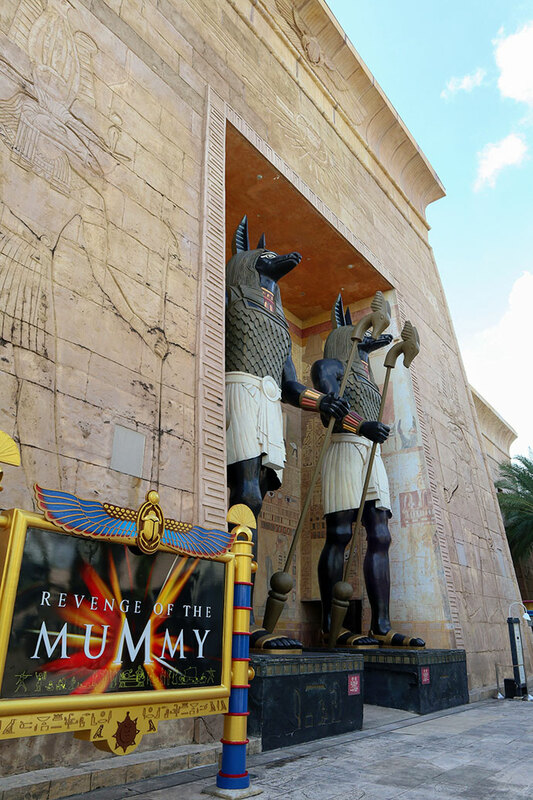 Revenge of the Mummy (min height 122cm) – You can’t go past this exciting ride for an action packed scream fest! A high-speed indoor roller coaster that navigates through sharp turns and a fast reverse as it pits guests against fireballs, scarab beetles and robotic warrior mummies — all in total darkness. 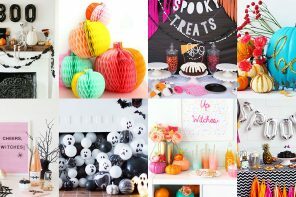 Be prepared for fast dips and turns, both backwards and forwards as well as lots of scary effects. Emma was so terrified she let out a few curse words that I didn’t know were in her vocabulary, but loved it so much that we went on in 3 times! There are a few scary scenes that she knew were coming and closed her eyes for the 2nd and 3rd time. Lol! This ride is Awesome with a capital A! Both times we’ve visited the park, the queues have always been short. There is also a single-rider queue that almost guarantees you walk straight onto this ride. You can’t take any bags or loose items with you, but there are free lockers to the left of the ride entrance that are available for use. 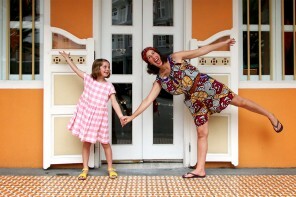 Treasure Hunters (no min height if escorted) – A car driving ride and perfect for young kids. Let the youngest in your group steer the jeep. The queues get super long as there is no Express Pass for this ride, so head there early and get it out-of-the-way. On our first visit we waited a hot 45min for this ride and vowed never to make that mistake again. This time we headed there first! 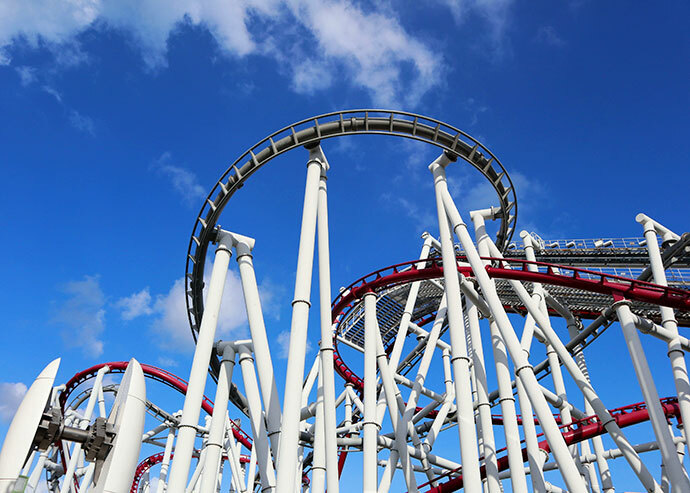 Thrill seekers should make a bee-line straight to Sci-Fi City for some hair-raising ride and roller-coaster action. If your little ones are into Transformers, make sure you catch the Autobots Roll Out performance with plenty of meet-and-greet photo opportunities after the show. Most of this zone is undercover so it’s a good place to retreat to for some shade or if it’s raining. Battlestar Galactica: HUMAN vs CYLON (min height 125cm)-The Battlestar Galactica dueling coasters are INSANE and even though it’s quite an old TV property now, sci-fi nerds and fans of the old show will appreciate the detail that has gone into the waiting areas. There are 2 roller coasters to ride. The HUMAN one is a classic sit down coaster, and the CYLON one is inverted where your feet hang. They both go super fast with at a top speed of 90km/hr, it takes 90 seconds to complete its 1 kilometre track on each coaster. Not for the faint hearted with several inversions, a zero-gravity roll, a Cobra roll, corkscrews and vertical loops. The ride is the tallest of its kind in the world at 42.7m (equivalent to 14 storeys). I loved this coaster on our first visit 6 years ago and rode them several times. This time not so much. I’m obviously getting to old for these kind of intense rides and felt quite sick afterwards. I actually threw up after my ride on the HUMAN roller coaster (made it to a bin luckily). Emma thought it was funny, I thought I was going to die! Mr Man actually had to go back to the hotel for a lie down after riding the CYLON one as he ended up so dizzy and just never recovered! We’ve both gotten soft in our old age. If you get motion sickness or vertigo I wouldn’t recommend these rides or at least leave them till the very end of the day just in case they make you unwell. If motion sickness isn’t an issue, go for it, they are pretty awesome. This was Emma’s first proper big-time roller coaster experience and she LOVED IT! I have a thrill-seeker on my hands. You can’t take any bags or loose items with you for safety. Anything you are carrying will have to go in a locker which is free for the duration of the wait time plus and extra 45min (approx). The attendants have metal detector wands to check your pockets at the entrance just in case you have forgotten to empty them. The lines can get quite long for these rides (upto 50min on the day we were there) so take the shortcut and head there early if this is your thing. 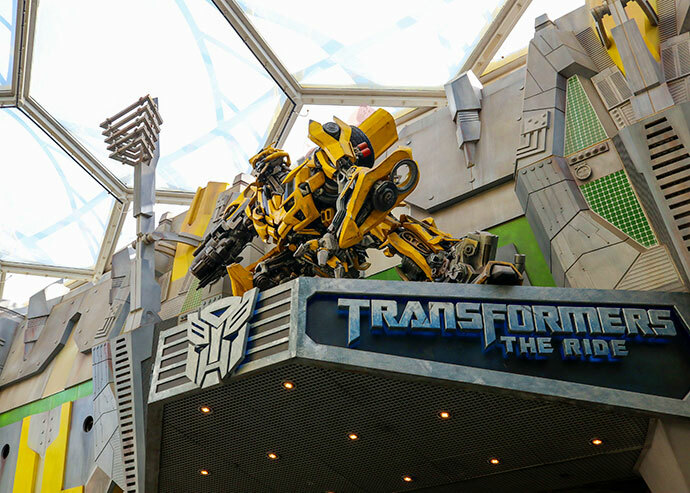 TRANSFORMERS The Ride: The Ultimate 3D Battle (min height 102cm) – Put on your 3D glasses and get ready for a spectacular ride. We nearly skipped this attraction after feeling not so great after my roller-coaster experience, but I’m glad we didn’t because WOW! This isn’t just a 3D movie, you are riding in a vehicle that moves around a lot and immerses you in the action packed story. It’s THE most popular ride at Universal Studios Singapore so get there first if you don’t have an Express Pass because lines can get super long apparently. This was probably (and unexpectedly) my favourite ride with The Mummy coming a close second. Accelerator (no min height if escorted) – There’s not really much on offer for younger kids in this area apart from the Accelerator which is similar to a spinning tea cups ride. If you get dizzy easily give this one a miss. Stroll down the streets of the ‘Big Apple’ in New York and enjoy the details of the vintage signage and street facades. There’s even a facade of the New York Public Library with its famous lions which has been featured in so many movies and TV shows. Much like the Hollywood zone, the New York area is a place where you’ll find mainly retail outlets and places to eat. Most of this zone is undercover so it’s a good place to retreat to for some shade or if it’s raining. 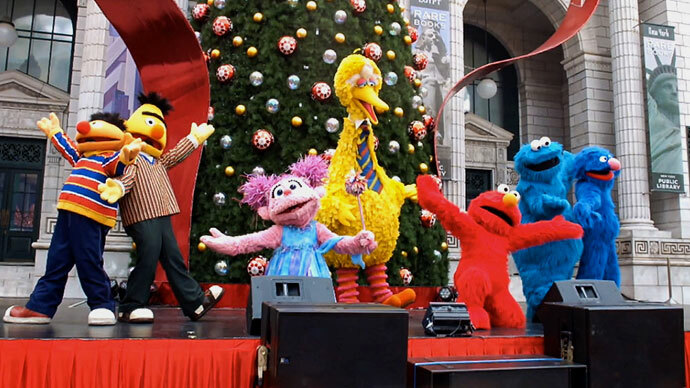 Here you’ll meet your favourite characters from Sesame Street where they will be performing special street and dance shows throughout the day. There’s a chance to take photos with your favourites after each show. I remember being so excited at seeing Big Bird for the first time that I nearly cried from the emotion. He looks exactly as he did on my little TV screen as a child all those years ago. This Hat shop is ‘technically’ in the Hollywood zone, but too cute not to include here. If you are looking for some quiet places to relax, take a stroll along some of the side streets in New York and along the wharf area. It’s rarely crowded and a good spot for photos. 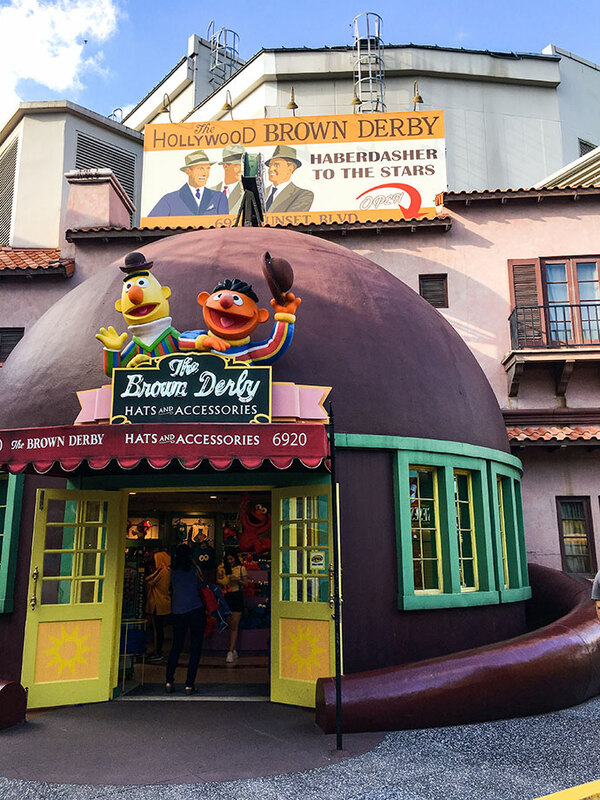 Sesame Street Spaghetti Space Chase (min height 122cm) – Join Elmo and Super Grover 2.0 in the world’s first immersive Sesame Street indoor theme park ride. Go on a mission with the whole family as super sidekicks to stop Macaroni the Merciless in his plot to steal all the spaghetti from Earth. Lights, Camera, Action! – This special effects stage, hosted by Steven Spielberg, brings you behind the scenes of intriguing movie sets. Be blown away by the filmmakers and incredible special effects as an empty sound stage becomes the setting for a major hurricane about to hit New York City. I was really surprised at how entertaining this was, with lots of practical effects including real fire. 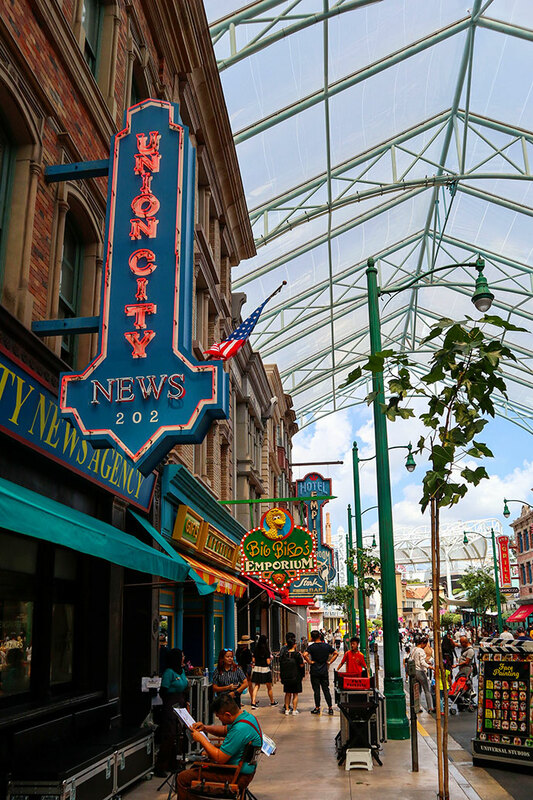 There are tons of places to eat all over Universal Studios Singapore, with at least on sit down dining option and various snack vendors in each zone. Avoid the lunch time crowds from 12:00-2:00 by eating either before or after these times. 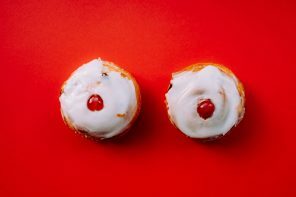 Admittedly we don’t tend to eat meals at theme parks, preferring to have a big breakfast and a few snacks, drinks and ice-creams throughout the day. I noticed the food was quite expensive so factor that into your budget. For example a slice of pizza was SGD$11 and meal with drink around $15-20. 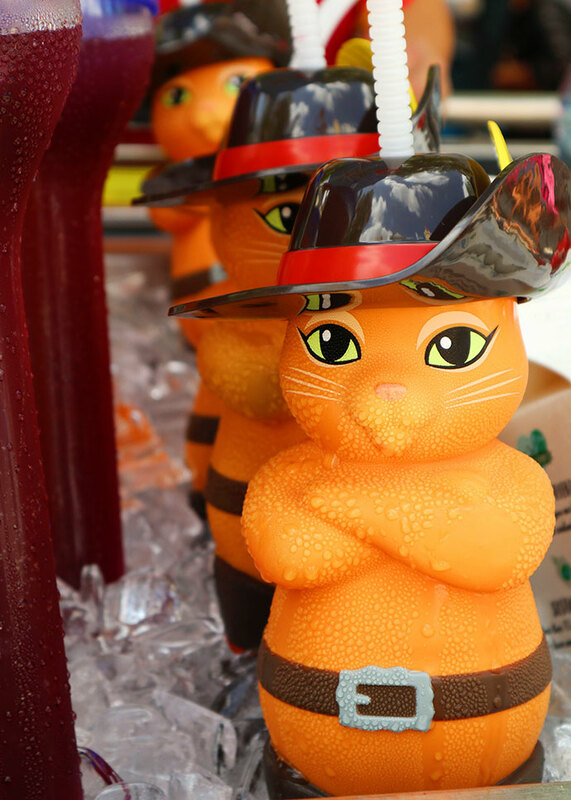 Drinks around the park were priced from $5. There are both western and asian food options throughout the park. There are also plenty of places to eat just outside the park so you may consider getting a pass out stamp and choosing that option. Malaysian Food Street just outside at Resorts World Sentosa is my pick. Food from outside is discouraged/not allowed, but I did see some families with packed lunches. It’s up to you whether you want to bring some healthy snacks, baby food or food for special dietary requirements. Our bags were not checked on entering. I’m not advocating breaking the rules but if you keep it discreet and you should be fine. 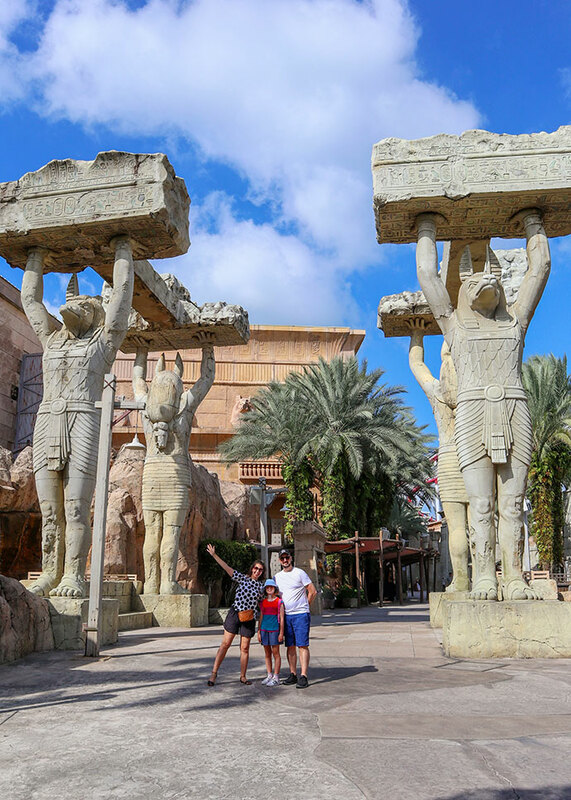 Universal Studios Singapore is a great day out for the whole family. Some prior planning will help you make the most of the time you have at the park without feeling like you’ve missed out on anything. Take some time to chat together as a family and decide on what you’d most like to enjoy together. It’s important to pace you day so everyone can have fun without getting too hot or over-tired. 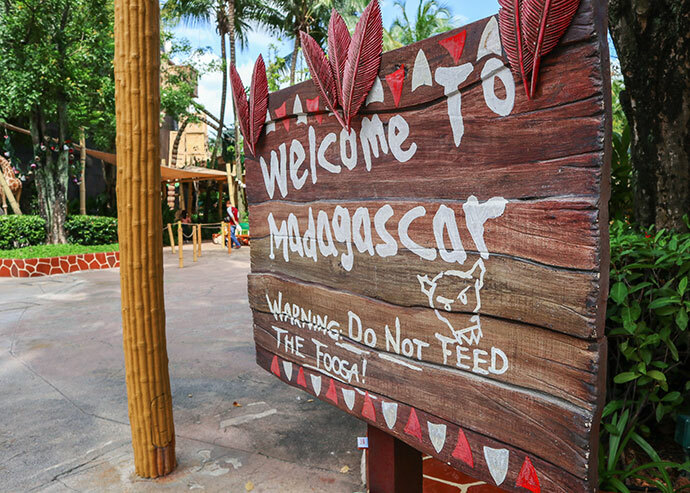 Families with younger kids will love Madagascar and Far Far Away, and will probably find the shows throughout the park and character meet-and-greets most enjoyable. Families with older kids and teens can ride the most thrilling attractions throughout the park. 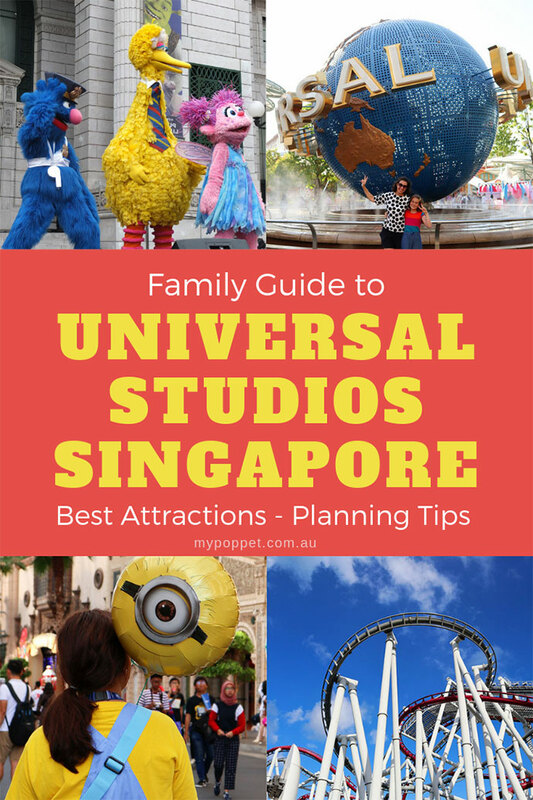 I hope this Family Friendly Guide to Universal Studios Singapore has been helpful in planning your visit to this Universal theme park. If you have any further questions, leave them in the comments section and I’ll add the answers to the guide. Have a great time at Universal Studios Singapore! My Poppet was provided with media passes for the purposes of this review – All thoughts and opinions are my own. 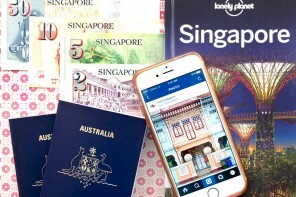 All prices are quoted in Singapore Dollars (SGD) and were accurate at time of publishing.